Diagram of interactions within the MVC pattern. 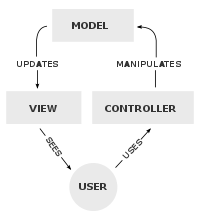 Model–View–Controller (usually known as MVC) is an architectural pattern commonly used for developing user interfaces that divides an application into three interconnected parts. This is done to separate internal representations of information from the ways information is presented to and accepted from the user. The MVC design pattern decouples these major components allowing for efficient code reuse and parallel development. Traditionally used for desktop graphical user interfaces (GUIs), this architecture has become popular for designing web applications. Popular programming languages like Java, C#, Python, Ruby, PHP have MVC frameworks that are used in web application development straight out of the box. The central component of the pattern. It is the application's dynamic data structure, independent of the user interface. It directly manages the data, logic and rules of the application. Any representation of information such as a chart, diagram or table. Multiple views of the same information are possible, such as a bar chart for management and a tabular view for accountants. Accepts input and converts it to commands for the model or view. In addition to dividing the application into these components, the model–view–controller design defines the interactions between them. The model is responsible for managing the data of the application. It receives user input from the controller. The view means presentation of the model in a particular format. The controller responds to the user input and performs interactions on the data model objects. The controller receives the input, optionally validates it and then passes the input to the model. As with other software patterns, MVC expresses the "core of the solution" to a problem while allowing it to be adapted for each system. Particular MVC architectures can vary significantly from the traditional description here. The use of the MVC pattern in web applications exploded in popularity after the introduction of NeXT's WebObjects in 1996, which was originally written in Objective-C (that borrowed heavily from Smalltalk) and helped enforce MVC principles. Later, the MVC pattern became popular with Java developers when WebObjects was ported to Java. Later frameworks for Java, such as Spring (released in October 2002), continued the strong bond between Java and MVC. The introduction of the frameworks Django (July 2005, for Python) and Rails (December 2005, for Ruby), both of which had a strong emphasis on rapid deployment, increased MVC's popularity outside the traditional enterprise environment in which it has long been popular. MVC web frameworks now hold large market-shares relative to non-MVC web toolkits. Although originally developed for desktop computing, MVC has been widely adopted as an architecture for World Wide Web applications in major programming languages. Several web frameworks have been created that enforce the pattern. These software frameworks vary in their interpretations, mainly in the way that the MVC responsibilities are divided between the client and server. Because MVC decouples the various components of an application, developers are able to work in parallel on different components without impacting or blocking one another. For example, a team might divide their developers between the front-end and the back-end. The back-end developers can design the structure of the data and how the user interacts with it without requiring the user interface to be completed. Conversely, the front-end developers are able to design and test the layout of the application prior to the data structure being available. By creating components that are independent of each other, developers are able to reuse components quickly and easily in other applications. The same (or similar) view for one application can be refactored for another application with different data because the view is simply handling how the data is being displayed to the user. Simultaneous development – Multiple developers can work simultaneously on the model, controller and views. High cohesion – MVC enables logical grouping of related actions on a controller together. The views for a specific model are also grouped together. Code navigability – The framework navigation can be complex because it introduces new layers of abstraction and requires users to adapt to the decomposition criteria of MVC. Multi-artifact consistency – Decomposing a feature into three artifacts causes scattering. Thus, requiring developers to maintain the consistency of multiple representations at once. Pronounced learning curve – Knowledge on multiple technologies becomes the norm. Developers using MVC need to be skilled in multiple technologies. ^ "More deeply, the framework exists to separate the representation of information from user interaction." The DCI Architecture: A New Vision of Object-Oriented Programming – Trygve Reenskaug and James Coplien – March 20, 2009. ^ Burbeck (1992): "... the user input, the modeling of the external world, and the visual feedback to the user are explicitly separated and handled by three types of object." ^ Davis, Ian. "What Are The Benefits of MVC?". Internet Alchemy. Retrieved 2016-11-29. ^ Buschmann, Frank (1996) Pattern-Oriented Software Architecture. ^ Moore, Dana et al. (2007) Professional Rich Internet Applications: Ajax and Beyond: "Since the origin of MVC, there have been many interpretations of the pattern. The concept has been adapted and applied in very different ways to a wide variety of systems and architectures." ^ Model–View–Controller History. C2.com (2012-05-11). Retrieved on 2013-12-09. ^ Notes and Historical documents from Trygve Reenskaug, inventor of MVC. ^ "A note on DynaBook requirements", Trygve Reenskaug, 22 March 1979, SysReq.pdf. ^ Krasner, Glenn E.; Pope, Stephen T. (Aug–Sep 1988). "A cookbook for using the model–view controller user interface paradigm in Smalltalk-80". The Journal of Object Technology. SIGS Publications. Also published as "A Description of the Model–View–Controller User Interface Paradigm in the Smalltalk-80 System" (Report), ParcPlace Systems; Retrieved 2012-06-05. ^ The evolution of MVC and other UI architectures from Martin Fowler. ^ a b Leff, Avraham; Rayfield, James T. (September 2001). Web-Application Development Using the Model/View/Controller Design Pattern. IEEE Enterprise Distributed Object Computing Conference. pp. 118–127.